It's probably time that I wrote about my Nokia 770. I've put this off for some time because it is one of those rare instances when I have been disappointed by a gadget, and what makes it worse is that if I had done even a teensy bit of research and been a little less impulsive I wouldn't be feeling so sheepish about it. Now don't get me wrong, I still would have bought it, for it is fantastic at what it does, it just doesn't do what I wanted it to do. 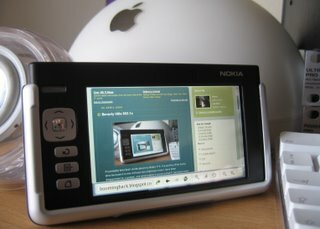 The 770 isn't an UMPC, its a web tablet. Essentially it is touch screen about the size of an iPod (not the screen of an iPod, rather the whole iPod itself) with wi-fi and Bluetooth. It runs on Linux, and comes with a version of the Opera browser. Although it is a Nokia product, it's not a phone, and does not use a sim card. The idea is that you connect to the internet via wi-fi, or through your Bluetooth enabled phone. I have an Airport network throughout my house, and I love the 770. It boots up faster than any of my Macs, is slightly larger than an iPod and I can keep it by the side of the bed for when I absolutely have to check my mail without having to go into the other room and turn on my iMac. The fact that between the Very Understanding Girlfriend and I there are two Powerbooks in the house as well is neither here nor there, and I will choose to ignore it for the rest of this discussion. I can sit in the front room and while I'm watching tv I can also surf on the 770 (again ignoring the fact that TV is also connected to a Mac Mini that acts as a media centre and DVR, and until I got the 770 I was perfectly happy using picture-in-picture to browse the net while I carefully ignored the ads while waiting for Battlestar Gallactica to start). So if it is such a great toy in the house, why am I disappointed? The fact is that I didn't get it for the house (that would be just plain lazy), I actually got it for the office. Almost everything I do on my computer in the office is online and web-based. I use gmail for all my mail, I now use Google Calendar (synched up with iCal) for my schedule, Writely for my documents, etc, etc. There is very little that I do that is tied to any one specific machine. Our office is very big, spread over a couple of floors, and there is a wi-fi network throughout the complex (I hope you can see where this is going). Rather than carrying my 12" powerbook from meeting to meeting, I thought I would get the 770 and access all my web-based applications that way. Which I could, but for one small problem. You see the 770 is only compatible with 802.11b/g, and of course my office runs an 802.1x network. Apparently Nokia will be releasing an upgrade to the OS later this year, and there is speculation that 802.1x compatibility will be addressed, but as of yet there is no firm date for that release. If I had spent even a moment of time researching the 770 I would have realised this. I still would have bought it, as it is a really cool way of preventing calorie loss, I just wouldn't be faced with the feeling of being slightly cheated every time I have to pick up my oh-so-heavy powerbook and lug it from room to room.